We all know everything about Rasmus Dahlin. His favorite video game, his favorite food, that his Mom played some odd field hockey/hockey sport in Sweden as a young girl (bandy). It’s so easy to find out everything we need to about any NHL prospect. That’s the world we live in. But it hasn’t always been this easy. That’s why covering and analyzing the NHL Draft has always been a challenge for me as a Buffalo sports reporter. This will be the 30th NHL draft I have been a part of reporting on related to the Buffalo Sabres. I can’t name all of the 30 first round draft picks. Without looking it up, I doubt you can too. Before they were actually drafted, most rabid hockey fans didn’t have any idea who they were. That’s the challenge in providing some insight and perspective when it comes to the NHL Draft. Coming just three months after the NFL Draft, there is a certain expectation that the NHL Draft will be similar. It’s not. The NFL drafts familiar college football players at age 21 or 22, and they immediately join the roster, and immediately make some kind of contribution. The NHL drafts 17-18 year olds, with the expectation that most of them will be 2-3 years away from joining the parent club. These are kids, who are still developing physically and still developing their game. So while we as reporters and fans have a certain NFL-enhanced expectation that these young NHLers will fill in the depth chart and help the organization, it’s false. The hit rate on even first round NHL draft picks is way lower than those from the NFL. Understandable, because of the difference in age. But it’s hard to fight the urge to look ahead and see how an NHL top pick will help the team. We all do it. Fans and reporters. This occurred to me in the run up to Dahlin-mania. I had the chance to interview NHL Director of Scouting Dan Marr. As I prepared for this interview, I read a lot of scouting reports about Dahlin. They were all glowing. Beyond glowing. 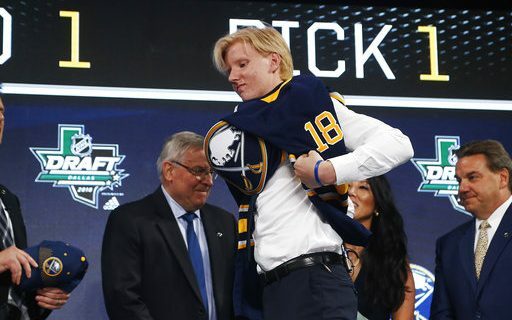 There was very little negative said about Dahlin. In fact, legitimate NHL scouts didn’t shy away from comparing him to legends like Niklas Lidstrom and stars like Erik Karlsson or Victor Hedman. Wait, hold on. In the run up to the NFL Draft, we spent too much time focused on Baker Mayfield’s crotch grab, Josh Rosen’s parents net worth, and Josh Allen’s weather-related games. So how could this be so different? When I asked Marr about Dahlin being a “perfect prospect” and can that really be true, he gave me a death stare. I figured that’s just how the NHL does it. It’s to their benefit to accentuate the positives about a 17 year old kid. Plus, that 17 year old has time to fix whatever flaws he may have. But it felt weird to me to be in the middle of a prospect scouting season and hear almost nothing negative about the players. We all know that isn’t true. No NFL scout would dare come out and tell you Baker Mayfield is the next Brett Favre, or Allen is the next Jim Kelly. They might compare styles, but never go that far to make a straight comparison. While prospect websites and scouting reports have become much more available online, it wasn’t always that way. Which is part of the reason why’s it’s a challenge providing Buffalo sports good information on draft picks. There were many years, pre-internet, that we struggled to find video highlights of the first round pick to show on TV. Can you imagine that in the NFL? All you would usually be able to find was basic info like height, weight, stats and position. Not much to report on and provide analysis. Even the most die-hard Sabres fans wouldn’t recognize the names of most first round picks. That was the challenge in covering the NHL Draft. I always found myself trying hard to provide some kind of information, but holding off on saying whether it’s a good pick or not. I had no clue. Neither did anyone else, including the teams. But that doesn’t stop Buffalo hockey fans from getting overly excited about the Draft. It’s one thing to get worked up over Dahlin. It’s another to go out and buy a Zagrapan sweater. Dahlin is the exception to almost all of this. He’s legit, so says everyone. But when the Sabres make their high second round pick, there will be breathless praising of the selection by hockey experts. Be careful. Watch the video, read the reports. Then tuck it away for a few years before you start to pencil that player into your line sheets.